Join the Mad Hatter and the Queen of Hearts in a magical Wonderland this winter, as Polka’s traditional show for the season shines a new light on one of the most loved stories of all time. Lewis Carroll’s Alice’s Adventures in Wonderland comes alive for a new generation at Polka Theatre from 22 November 2013 – 15 February 2014. Directed by Rosamunde Hutt, written by Simon Reade and with set design by Ti Green this is a Wonderland with a difference. Dusting off the Victorian setting Polka take a fresh look at the story to bring Lewis Carroll’s vivid dream world to life, bursting with original songs and music, stunning contemporary set and costume designs and plenty of imagination and humour for children aged 6+ and their families. Top of the list of children's favourites since 1865, Alice’s Adventures in Wonderland is a timeless tale about growing up. Audiences meet a very modern Alice, played by Ebony Feare; a curious, intelligent and fearless character who is finding out who in the world she is Exploring her attic on a cold winter’s day, Alice’s sister wants her to be quiet, her Mum wants her to stop eating sweets and no one wants to play. But as the White Rabbit appears, Alice's attic is magically transformed into a series of beautiful, strange and fantastical worlds. Writer Simon Reade remains true to the original, with a gloriously funny and lively script full of mad, oddball characters and curiously strange occurrences! Leave behind the cold winter afternoons, tumble headfirst down the rabbit hole and enter a world where Alice learns to find her own voice and be courageous. There will be magic, heart, jeopardy, slapstick and of course a song to sing on the way home. Alice’s Adventures in Wonderland plays at Polka Theatre from 22 November 2013 – 15 February 2014 for ages 6+. Tickets are £16 (concessions £11) and can be booked online at www.polkatheatre.com or by calling the Box Office on 020 8543 4888. Adventures in Wonderland is sponsored by Morrisons Solicitors. You will be sad to hear of the death of Robert Leeson, one of the leading children’s writers and children’s literature critics of the late twentieth century. Alongside a considerable body of writing for children, Bob Leeson was pre-eminent among those writers, critics and campaigners who brought a social awareness to children’s literature, making it responsive to a more diverse society. His influential Reading and Righting (1985) argued for a children’s literature that was inclusive and committed to social equality. Bob Leeson was also a great and active supporter of IBBY, serving on the IBBY UK Committee for many years in a number of roles. Following his retirement from the Committee, he was one of our select band of honorary members. I will be sending condolences to Bob’s widow, Gunvor, and his family, on behalf of us all. Hot Key Books returns with another Story Adventure, a free interactive online writing project for KS2 children, for the first time supported by literature charity Booktrust. Launched on 7 October, this new Adventure is with award-winning author Jim Eldridge. The second half of his new book THE WRESTLING TROLLS has disappeared and he needs help to rewrite it in just 8 weeks! Running from 7 October to 16 December 2013, Jim will post a new chapter of the book on www.thestoryadventure.com each week and ask children what THEY think should happen next. Not only will they have the chance to influence the story and watch their creativity come alive, but Adventurers whose ideas are chosen by Jim will be credited in the final published book. Children and schools can sign up as a whole class / library group or join individually. Alongside the interactive parts of the story there is also a schedule of activities reviewed by primary school teachers that the children can get involved in which fit into the Reading and Writing Curriculum (EN1, EN2 and EN3) including non-fiction, drawing, science, maths and journalistic tasks that will support and further their learning. Using a secure site hosted on a Ning community platform, www.thestoryadventure.com already has over 400 subscribers after the successful Fleur Hitchcock Story Adventure that saw 2,000 children help author Fleur Hitchcock to write the sequel to Sunday Times Children’s Book of the Week SHRUNK! The sequel SHRUNK! MAHEM AND METEORITES will be published in January 2014. Alison Keeley, Head of Schools at Booktrust says: "Booktrust is delighted to support a scheme that not only engages children in writing, but gives them a tangible reward in the form of a credit in a published book. Children are natural storytellers and hopefully this will highlight for them the enjoyment in writing. Hot Key Books have shown themselves to be creative innovators and we look forward to working with them." This year two people have been awarded the honour of the SLA School Librarian of the Year at a celebration at the Hotel Russell in London, on 7th October. Hilary Cantwell , librarian at St Paul’s Community College (http://www.stpaulswaterford.ie/ ), Waterford, Republic of Ireland. Hilary gained expertise in New York schools and public libraries before joining an Irish government programme to create school libraries. St Paul’s has 430 students and is in a rural county with the highest unemployment in Ireland. It is affiliated to the Irish government’s inclusion programme, Delivering Equality of Opportunity in Schools (http://goo.gl/GJ57jQ ). John Iona , librarian at Oasis Academy (http://www.oasisacademyenfield.org/ ), Enfield, Middlesex. John creates award-winning resources, delivers the school’s Extended Project Qualification programme and plays a significant role in curriculum planning and support. The school has 1,100 students of which up to 70% have English as a second language. John actively promotes reading for pleasure with a number of initiatives including Reading Games . The full programme for Scotland’s second national celebration of books and reading has been announced. Building on the success of last year’s inaugural Book Week Scotland, Scottish Book Trust will deliver a week-long nationwide focus on books, reading and writing from 25 November to 1 December, 2013. Three free picture books gifted to every Primary 1 pupil in Scotland. The titles consist of the shortlist for the Scottish Children’s Book Awards 2013: Paper Dolls by Julia Donaldson and Rebecca Cobb, What's the Time Mr Wolf by Debi Gliori and Jumblebum by Chae Strathie and Ben Cort. Over 400 book-related events in 349 different locations including pop-up book shops, an all night pyjama party in an art gallery, events in libraries and underground book mic nights in a nightclub. 150,000 free copies of Treasures, a short story and poem collection written by the people of Scotland, will be distributed through many channels including bookshops, libraries,VisitScotland visitor centres and the Royal Voluntary Service network. Well known contributors include John and Carole Barrowman, Mairi Hedderwick and Denise Mina. The Ten Favourite Scottish Books will be announced at the end of Book Week Scotland. Scottish children’s illustrator and author Mairi Hedderwick will bring her most famous character, Katie Morag, to life for children across Scotland during a special live broadcast in partnership with the BBC on 28 November. Individuals, communities and organisations across Scotland will be encouraged to host a Big Book Bash to celebrate reading during Book Week Scotland. You can download an information pack from www.bookweekscotland.com. Think you know Scotland’s most inspiring reader, or most committed fan? Perhaps you know someone who likes to read in an unusual place? Nominate them at www.bookweekscotland.com to be a national Reading Hero. Five large art installations will be unveiled in communities across Scotland to inspire reading. The names of this year’s Book Week Scotland Author Ambassadors were also unveiled: Children’s author and illustrator Nick Sharratt, popular fiction author Shari Low and poet Ryan Van Winkle will lead the push to spread the joy of reading throughout the country. 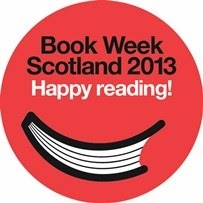 “The first Book Week Scotland in 2012 was a great success with over 20,000 people attending events across Scotland. This year’s programme provides even more exciting events for children and adults to celebrate the wonder of the written word. “Scotland has a strong literary canon and Book Week offers a great opportunity for everyone to celebrate our word-class wealth of talent, creativity and imagination. “Book Week Scotland is one of the most anticipated sequels of 2013. The programme is itself a treasure trove of events for children just starting to learn about the wonders to be discovered between the covers of a book, for people for whom books are one of the joys of life, for book lovers in every part of Scotland. I can't wait." "We are really excited to be supporting Book Week Scotland this year. It's great that local libraries are going to be venues for lots of events, with over 100 authors visiting libraries for 'Book Week Scotland in Libraries', where you will get to meet authors and listen to unique readings. "We're also looking forward to seeing lots of fun Big Book Bashes taking place in libraries across the country and don't forget to pop into your local library during the week to pick up your free copy of 'Treasures'. "Before you vote for your favourite Scottish book, why not discover more about it by logging onto askscotland.org.uk and one of our librarians will answer your question." Initiated by the Scottish Government and supported, along with a Readers in Residence programme in libraries, by £250,000 from Creative Scotland, Book Week Scotland will be delivered by Scottish Book Trust. Book Week Scotland in libraries is funded by The Scottish Library and Information Council. Photographs from this morning’s announcement are available on request from helen.croney@scottishbooktrust.com. Audio clips from key spokespeople including Marc Lambert, CEO of Scottish Book Trust, and Actor and Presenter John Barrowman are available at http://audioboo.fm/ on the Scottish Book Trust Audioboo page.